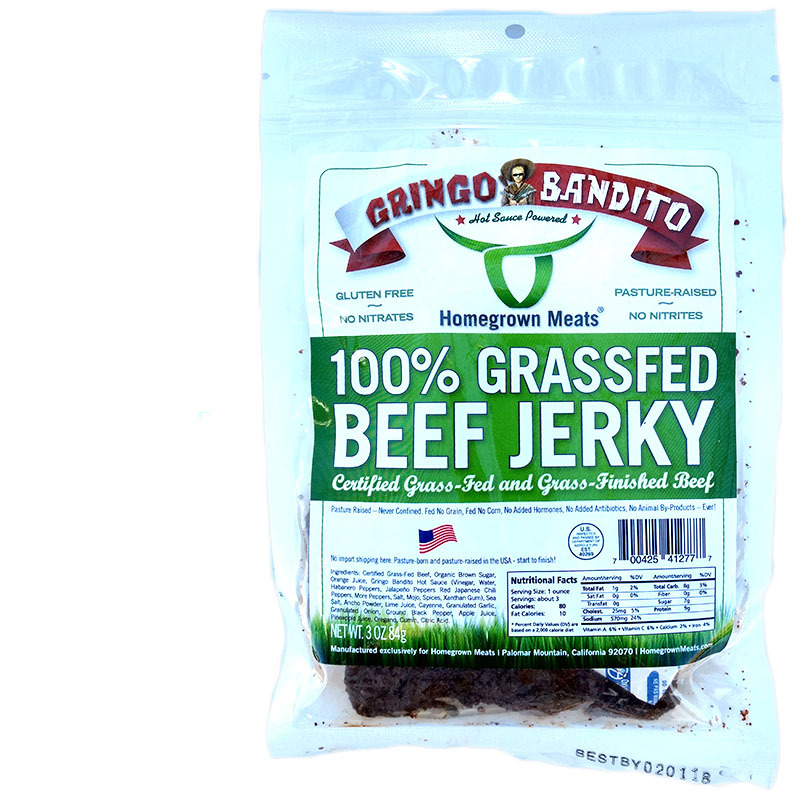 Certified grass-fed beef, organic brown sugar, orange juice, Gringo Bandito Hot Sauce, sea salt, Ancho Powder, lime juice, cayenne, granulated garlic, granulated onion, ground black pepper, apple juice, pineapple juice, oregano, cumin, citric acid. The first flavor I pick up is the signature Gringo Bandito hot sauce. It doesn't start out hot, but slowly builds up. Mostly, I get a light sweet and a mixture of chile pepper and citrus. The chewing brings on a light bit of natural meat flavor, but also a bit more citrus flavor, and a savory blend of garlic and onion. The heat continues to build. 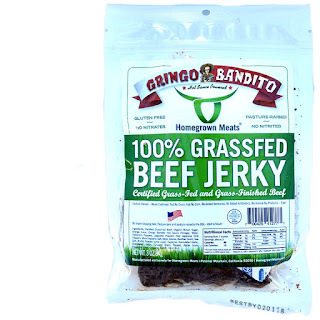 For being marketed as a "Gringo Bandito" flavored jerky, it definitely delivers. I get a lot of the famous hot sauce flavor, but I also get quite a bit fruity citrus too. It creates a unique tanginess against a piquant habanero and jalapeno, and a low level of vinegar. It's also noticeably sweet. the level of heat remains at "medium hot" on our heat scale (level 4 out of 5), making it pleasure-inducing for spicy food lovers while keeping it snackable for mindless munching. Otherwise, the primary taste profile is that of the Gringo Bandito hot sauce, but well mixed with citrusy orange and pineapple, a noticeable sweet, a lighter vinegar note, and light chile pepper flavor. The level of saltiness feels moderate, and the natural meat flavors remain light in the background. The meat consistency looks and chews good. Many pieces seemed dry and chewy, but a few others felt moist and tender. I did not encounter any stringiness, or encountered anything unchewable. These are mostly strips of pure meat. Some pieces chewed down to a dense, mushy character, not at all steak-like. Others, meanwhile, had a meaty texture, but was rather dry and tough. This Gringo Bandito beef jerky delivers much of the same signature flavor that made the hot sauce famous, but also adds in a nice blend of citrusy orange and pineapple, with vinegar and chile peppers. 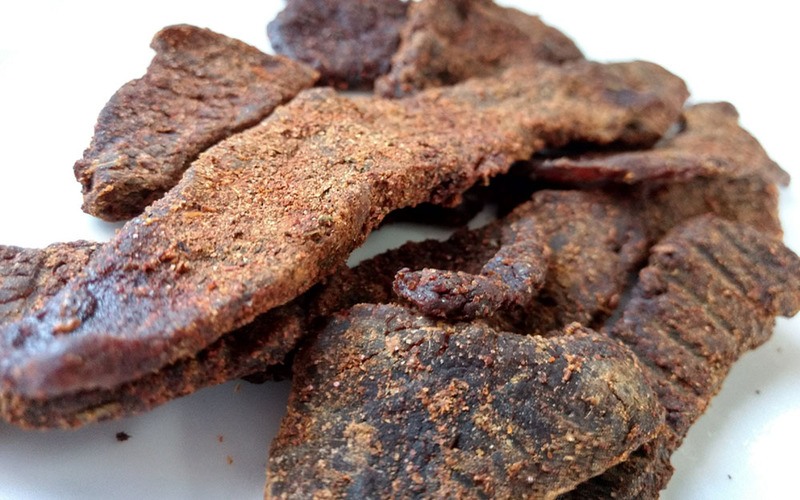 It's overall a sweet jerky that packs a decent level of heat, but balances in the savory ingredients of garlic, onion, and salt. The chewing texture didn't offer much to be desired, mostly dry and tough, while the few soft and moist pieces felt mushy. 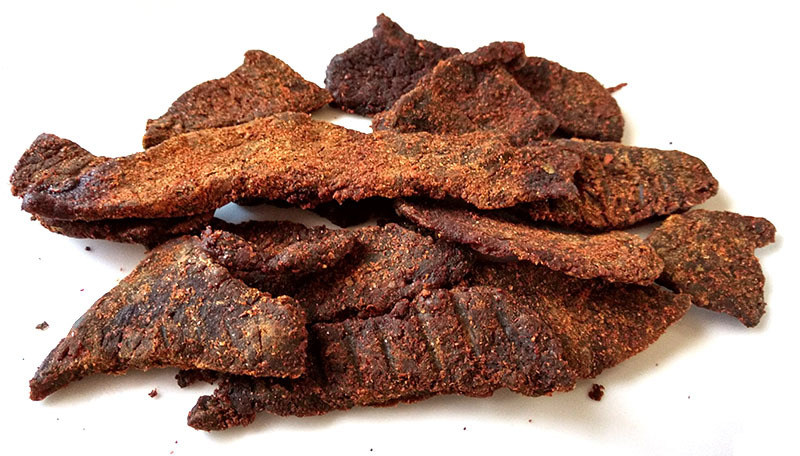 All in all, you get an awesome beef jerky marinade, over well-trimmed slices of pure meat, but a chewing texture that falls short.